My 7th graders were really having difficulty playing against the 2-3 zone, which we seem to be running into frequently in youth tournaments. If you find your team in a similar situation, I think this article will help. I dedicated an entire practice session to learning how to beat this defense in a simple way that young kids could understand. I used some visuals and made it interactive for them, instead of me just talking (the kids get bored after a couple minutes of me lecturing). First, I pulled a table out on the floor, and we all got around it with my clipboard and some tokens (pennies and dimes) that they could move around on the clipboard. I let the kids set up the board and helped them with placing the defense in a 2-3 zone. Then I told them to set the offense markers in a 1-3-1. I had one orange marker for the person with the ball. Then I let them just start figuring out where the gaps in the zone are. So every time they would position the offense, I would then move the defense and then they would have to find the gaps again. They really got into this, like playing checkers. Then we went out onto the court to practice what they discovered on their own. Amazingly, the kids, on their own, came up with the same offensive scheme that I had devised, and it is diagrammed in the drawings below. Now, on the court, I used hula hoops and some old car floor mats that I threw down in the gaps so they could see where to move to. Having these visuals seemed to help them understand where to move on the floor. One caution: players could trip and injure themselves with these objects on the floor, so we just used them in "walk through" ball rotations, not up to speed. First things to stress to the kids: you beat the zone by quick passing and movement, and avoid unnecessary dribbling (which allows the zone to recover). Dribble only to penetrate a gap, or improve a passing angle, or to get out of trouble. Offensive rebounding is very important since the zone defenders do not have clear-cut box-out assignments (as in a man-to-man). Now study the diagrams below, and at the end I will give you just a few simple rules that the kids have to remember. This zone offense will start with a 1-3-1 offensive set where our offense is already positioned in the gaps. One tip: your high post O4 might initially be positioned along the lane, and then as the point guard brings the ball into the forecourt, O4 makes a quick flash into the high post at the free-throw line. Make sure the wings are high and wide, so that the point-to-wing pass is not easily intercepted. Now notice in the Diagrams A thru D below how the offense moves as the ball moves. Each move is to fill a gap in the zone where you can get open for a pass and shot. When we pass to the right wing, O4 moves to the right lane and O5 moves to the corner and O3 moves inside the 3-point arc (Diagram A). If the ball is passed to the corner, O4 cuts hard down to the low block for the bounce pass from O5 (Diagram B), and O3 moves to the free-throw line area because if O4 does not get the ball, then O3 is often wide open (Diagram C). Now look at Diagram D. If the pass from the wing goes instead to O4 near the elbow, O4 can either shoot or pass to O3 for an open shot, or to O5 in the corner. Here’s an option where we can attack the zone straight up the middle, by passing, not dribbling. See the diagrams E and F above. O1 passes to O4. 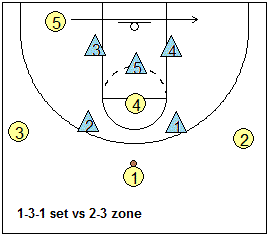 O4 pivots and faces the basket and if open can shoot it. Meanwhile, O5 who has been hiding behind the defenders down low, cuts into the paint for the pass from O4, and the lay-up. O4 makes the decision here… if the middle defender comes up to block the shot, then just fake a shot and bounce pass it to O5 down low. If the middle defender stays low, then just shoot it. If a wing defender moves in, pass off to that wing. Now here is a play for our point guard, O1. If O1 yells "1", then both post players move down low to the low blocks. Now O1 will try to dribble between (split) the two outside defenders right up the middle and will pull up for a shot just inside the free throw line. Do not try to take it all the way to the hoop as the low defenders will get you! Now, going back to the start of this play, if the two outside defenders stop the point guard from getting inside, then O1 should immediately pass off to either O2 or O3 on the wings, and then move back out to the point. Here is another play using a wing screen for O1. See the diagrams below. You can see that if O2 sets a screen for O1, and then O1 dribbles into the gap on the right he/she can stop and shoot the mid-ranged shot, or pass into the corner to O5. Again, do not dribble all the way to the hoop as the low defenders will get you! If O5 gets the ball, then O4 should cut down to the block looking for the pass from O5 (Diagram C). So you can see that there are certain areas (hula hoops) that we want to fill as the ball moves. The diagrams below show red circles that should be filled when the ball is in that location. In the end, the entire system is very easy for them to understand with very few rules. 1. Run the baseline and always be in ball-side short corner when ball is on the wing. 2. When the ball is at the high post, duck under the zone into the paint for the pass down low. 1. Move with the ball... always point toward the ball. Ball at point, be at the FT line. Ball on the wing, fill the hula hoop just below the ball-side elbow. Ball in the corner, cut down to the low block. 2. Look to score, or pass inside or opposite wing. 1. Look to penetrate from the wing, and make good passing decisions, avoid too much dribbling. 2. Look for the shot, and when the high post is at the elbow, the opposite wing drops down into the gap on the weak-side. 3. When high post dives to low block, the opposite wing slides into the high post or ball-side elbow area. 1. Keep the ball moving, with little dribbling, except to penetrate or open a passing lane. 2. Look for opportunity to dribble and split the two top defenders, and if they collapse, dish out to either wing. 3. Responsible for staying back (on top) to prevent the fast break.